….these two fellas are not brawling. Believe it or not, its two guys playing baseball. Believe it or not, this guy calls it bush league. In the top of the 8th inning of last nights Rangers v. Angels game, Jeff Mathis, Angels catcher hitting a torrid .229 on the season, attempted to run through Rangers catcher Max Ramirez and extend the Angels 9-6 lead. 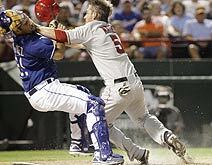 By the way, for a larger image and other game photos, go to the Dallas Morning News. Kudos to Milton Hinnant for getting a fantastic shot. Now, before I am accused of being some namby-pamby wimp who believes that baseball is a non-contact sport, let me clarify that I am all for a good break up play – even from light-hitting catchers (to be fair, Mathis had gone yard last night before the collision). But, forearm to the throat? Seriously? I mean, Come on, dude, at least make it LOOK like you are just trying to get to the plate. Hitters are so protective of themselves when pitchers throw up by the head (look no further than Coco Crisps’ recent antics), should collisions be any different? Happily, the baseball gods smiled on ole Max as he not only held on to the ball but got up and threw to the third for the double-play. Guess ole Jeff throws a forearm about as well as he normally hits. Maybe next time, she should try the A-Rod slap (see below). Honestly, I have come to expect nothing less from Scioscia and the Angels. Too bad, too, I really loved Scioscia the player. 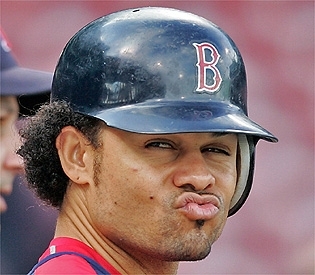 But, first place or not, his teams have always managed to strike a heady combination of bush league and intolerance. So, Jeffie, tonight, when you get one near the earhole or more preferably in the numbers, break the Angels’ mold and take your base (and your medicine) like a big boy. This entry was posted on July 8, 2008 at 6:22 pm and is filed under Uncategorized. You can follow any responses to this entry through the RSS 2.0 feed. You can leave a response, or trackback from your own site.